The annual Up Helly Aa shop window competition is run in January where local businesses are invited to decorate their shop windows in a theme related to or representing Up Helly Aa. The competition is judged each year by the Guizer Jarl. A combination of originality, humour and overall appearance are all taken into account! 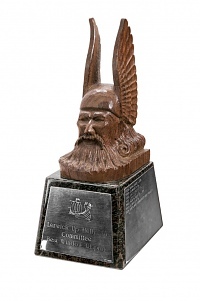 The prestigious trophy is a representation of a Guizer Jarl. It has been meticulously crafted from a single block of wood, a true piece of art. Entries for the 2020 competition need to be registered by Wednesday 22nd January. Judging will take place Saturday 25th January.